One of my favorite ingredients to have on hand is a box of puff pastry. 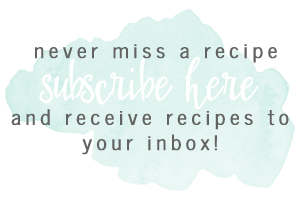 Whether it’s made into a savory recipe, or a sweet, this versatile freezer staple is good to have handy. When you are working with puff pastry it is important that it stays cold. 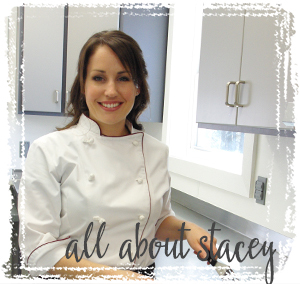 Thaw it in the refrigerator then work quickly when preparing it to bake. Puff pastry is a dough made from lots of butter, so the warmer it gets the more difficult it is to work with. 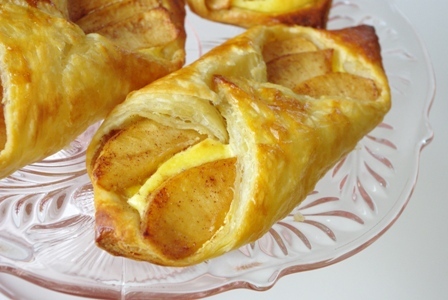 This breakfast Danish recipe can be made with a variety of seasonal fruits. A few ideas would be peach, strawberry, blueberry and of course, apple. When working with delicate fresh fruits like peaches and berries there is no need to cook the fruit ahead of time. The puff pastry brand that I use is Pepperidge Farm. It comes in two sheets that are easily folded out and cut. 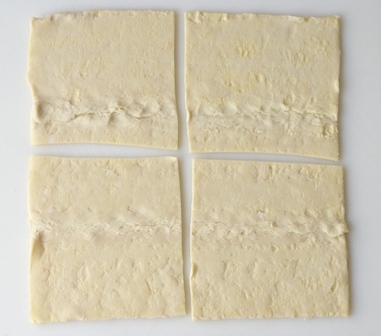 Each sheet of the pastry is cut into 4 sections to make the Danishes. Each section of pastry is topped with a dollop of cream cheese filling. I have sautéed the apples in a little bit of butter, brown sugar and cinnamon. Arrange the apples as shown on top of the cream cheese filling. Fold in two of the corners, then brush with egg wash. In a small mixing bowl, with an electric hand mixer whip cream cheese, sugar, lemon juice and egg yolks until smooth. Reserve egg whites to brush over the Danishes before baking. Peel and thinly slice each apple. Melt butter over low heat in a small sauté pan. Add apples and cook until nearly tender, but not mushy. Stir in brown sugar and cinnamon and cook for one minute. Remove from heat. Lay cold puff pastry out flat on your work surface- if necessary to prevent sticking you can sprinkle a little bit of flour on your work surface. 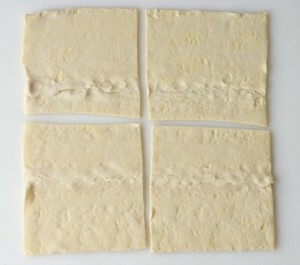 Cut each puff pastry sheet into 4 equal squares. Spoon about 2 ounces of cream cheese filling onto the center of each square. 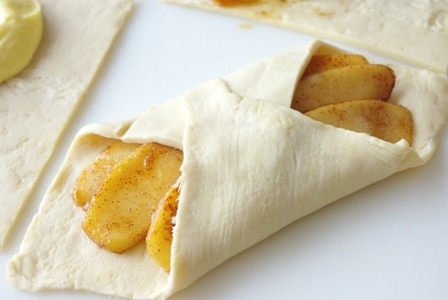 Then, lay about 6 cooked apple slices over the filling, fanning the slices out. 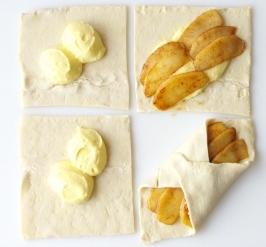 Fold two corners and place onto a parchment lined baking sheet. If you do not have parchment you can use an ungreased baking sheet. Mix your egg whites that you reserved from earlier with 1 Tablespoon of water. Brush egg wash mixture over the exposed dough of each Danish. Bake at 400 degrees for 12-15 minutes, or until pastry is golden brown.